The other day I blogged about LBS check-in fatigue. Basically what this refers to is the fatigue that comes from using the wide variety of location based apps out there. Upon reaching a new location someone who uses several of these must open each and ‘check-in’. This can several minutes in total as each app opens, pulls in friends data, finds your location and then checks you in. Low and behold, that day, a service was announced to address just such a condition from the makers of BrightKite. 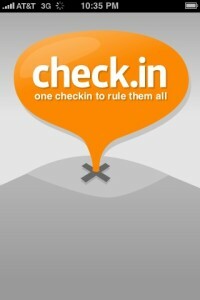 Check.in is a self proclaimed “one check in to rule them all” it seems. And although it is a self-made proclamation, I can now personally vouch for the awesomeness of this new app. Currently it’s not actually a full blown app as most of us know them. Rather it is a mobile web based app. It’s in a limited Beta right now but I was lucky enough to get my hands on it after Damon Cortesi connected me with Martin May who is working on Check.in. Damon had read my previous LBS fatigue post, took pitty on me and pled my case to Martin who promptly hooked the shiz up! It uses magical matching to figure out where you are at. Yes. Magic. I took some screen shots so you could get a feel for the process and how it works. Look! It found places near you! Voila! Check in to your LBS apps all at once! Magic! So. There you have it. Magical. The app doesn’t pull in your friends data, but this is part of the time saving it offers. 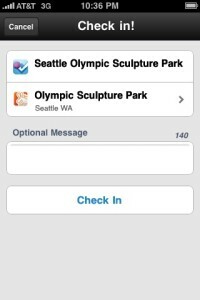 It allows you to check in to all of the apps in a much quicker fashion than each of them individually in aggregate. 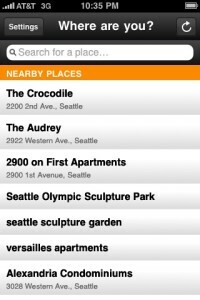 As new api’s are available from the other location based services they will likely add them. Does this app solve all of the “LBS fatigue” problems out of the gate? No. But it is very new and I’d bet that in time and through further iterations and developments this app could be your go-to-check-er-inner (I just made that word up). A huge thanks to Damon for the hook up and to Martin for allowing me to get such an early look at this awesome new tool! Several facts about the api and limitations added at the prompting of Jeff Croft. And for those wondering, no I do not currently have a Brightkite account. However, I will be setting one up to use with Check.in. Found this on Twitter the other day and immediately requested a beta invitation. I absolutely cannot wait for this to hit the market and SAVE me from my triple logins! Should be interesting to see how this pans out especially given the availability (or lack thereof) of the api’s. But the premise is definitely interesting – and welcome! I also think Brightkite should be focusing their efforts on their own service before it becomes obsolete. @CK – It is a little buggy. For example, I’m learning that I have to log in each time I open the app. That alone prevents me from using it. 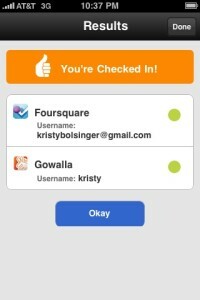 I still go into Foursquare and Gowalla individually. I never really used BrightKite so nothing has changed there for me. And who knows – if they do this right, this could be what keeps them from becoming obsolete. We shall see.